Did you watch The Office last week? It was their annual Christmas episode and there was a really sweet scene where Pam gave Jim a homemade comic book she created for him. The first three pages of “The Adventures of Jimmy Halpert” are now available for download on NBC.com. 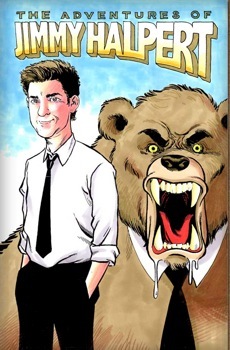 Pam describes the comic as featuring Jimmy Halpert, a mild-mannered paper salesman, who is bitten by a radioactive bear and becomes Bear Man. Ryan and Phyllis weren’t too impressed with it (Ryan’s literary critique: “There’s no connection between the origin story and the quest. We need to know who Jimmy Halpert was before he was bitten by the bear, otherwise it’s the bear’s quest. It’s also a little derivative of a serial called Bear Man…”), but Jim was clearly touched by Pam’s gift. Awww. The first three pages are just a taste, so let’s hope NBC decides to release the rest of “The Adventures of Jimmy Halpert.” What do you think of the comic book? Have you ever made such a thoughtful gift for someone?